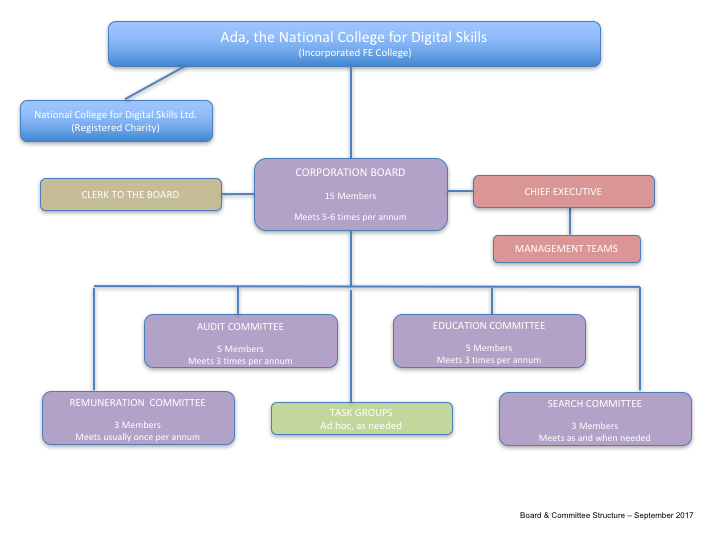 The Ada, National College for Digital Skills Corporation is an exempt charity formed under the Further and Higher Education Act 1992. The College was incorporated on 8th August 2016. The Instrument and Articles (I&A) of Governance set down the powers, membership, roles and responsibilities of the Corporation. The Corporation’s Board is accountable for the use of public funds and has a duty of care for the assets of the College. The role of its members is similar to that of non-executive directors or trustees. This body is advised by a clerk who is employed directly by the Corporation and who has access to independent professional advice. The Board’s composition is drawn from businesses, the community, students and staff. View the list of the members and their personal profiles. The Board meets at least five times a year. A number of committees have been established to undertake more detailed work. These are: Education, Audit, Remuneration and Nominations.